Let's start off with some clarifications. This wine is from the village of Moulin-à-Vent, which is a cru of Beaujolais, France. This is not anything like the Beaujolais Nouveau that comes out every third week of November. 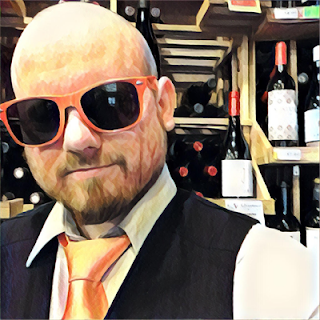 Beaujolais Nouveau is garbage. Yes, it's an exciting traditional thing to celebrate the vintage but the wine is crap. Beaujolais-Villages is the name of the Beaujolais where the wine starts to get good. One of my favorite simple and affordable wines is Louis Jadot Beaujolais-Villages. Give that sucker a chill and you've got the perfect red wine for spring. It's like drinking Jell-O. When you get into specific villages that qualify as what they call "Cru Beaujolais", well, that's when the wine gets great. 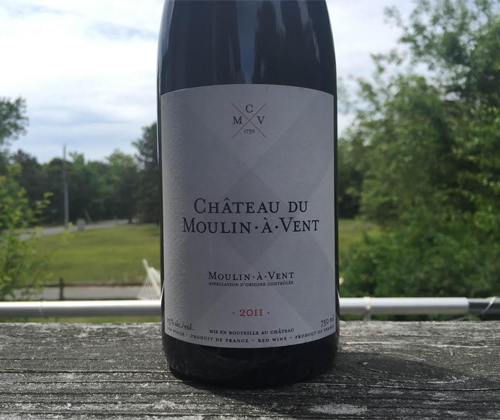 Moulin-à-Vent is one of those and, unlike the others, it likes to oak age its wines. Even though Beaujolais is technically part of Burgundy, where the reds are made from Pinot Noir, the red wine of Beaujolais is made from the Gamay grape. Gamay ripens two weeks earlier than Pinot Noir, and it's fruitier and softer. This made it a better option for a process that is used in many Beaujolais wines: carbonic maceration. Full clusters are put into barrels or tanks with carbon dioxide, where they collapse on themselves under the pressure, and run out into juice. This makes the wine light and fluffy and fun. But not all Beaujolais wines use carbonic maceration, especially those of the Cru Beaujolais. They make serious wine. The two wines I'm reviewing from Château du Moulin-à-Vent don't use it. 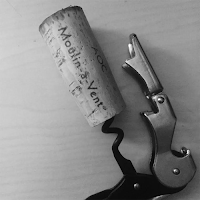 This is a review of Château du Moulin-à-Vent 2011 Moulin-à-Vent and next is Château du Moulin-à-Vent 2011 Champ de Cour Moulin-à-Vent, where I'll give you more info on the winery itself. I'm gonna be honest with you: the ageing listed for this wine confused the hell out of me. Percentages that don't add up, different kinds of oak from different specific forests, blah blah blah. So I'm just gonna keep it simple and say that it was aged in oak for 14 months. Okay? Okay. It's got a 13% ABV. The color of the wine is ruby red, thin in clarity along the edges, and a dark depth in the middle. The nose is spicy, smokey and earthy. Terragon, allspice, mushrooms, smoking kindling and plums. It's one of those wines I run into that has a certain something so alluring that I'll spend more time smelling it than drinking it. In the mouth it's almost weightless but it's still savory, has impressive tannin, and a punch of acidity. For flavors on the palate it's like biting into a super ripe plum, and there's vanilla and mushrooms in the background. The finish gets spicy and tannic. The suggested retail for this wine is $38 and that's a lot of money for the average wine consumer. This is a highly enjoyable wine that, if you're somebody that is a $38 per bottle person, you would have no issue with the money you spent on it. It's worth it, although it's not one that you'll be raving about in comparison to the other $38 bottles. It gets a 3 out 5 in price vs quality for Satisfying.